Any standing water is at risk of being a breeding ground unless you prevent it. Female mosquitoes like to lay their eggs in still water in a dark spot. The eggs float on the surface of the water for about 48 hours before hatching into larva. The larva will live in the water for about 10 days eating tiny plants and animals. It then changes into a pupa that floats on the surface of the water for about two days before the adult mosquito emerges. Either you need to make your pond/tank undesirable to female mosquitoes or you need to prevent the larva from developing into pupas. 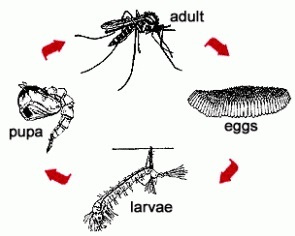 The length of time for the egg, larvae and pupae stages depend on temperature, so mosquito control is particularly important in the warmer months. A mosquito might go through its life cycle in 14 days at 70 F, but take only 10 days at 80 F.
Gambusia affinis, better known as the mosquito-fish, are the best fish to chose for maximum effect. Goldfish, killifish, flat-head minnows, and guppies are other types of fish that are also known to eat mosquito larvae. Larger koi do not eat mosquito larvae. Mosquito-fish are about an inch long and look similar to a guppy. A large female gambusia is capable of consuming over two hundred mosquito larvae in an hour. They are very aggressive fish and begin attacking the larvae when they are only a couple hours old. Unfortunately, they will also attack dragonfly larvae (which are another predator to mosquito larvae) and will be aggressive toward other fish and tadpoles. Mosquito-fish are very hardy and capable of adapting to different temperatures and salinity. They live naturally in the southern United States. However, some varieties of mosquito fish have been bred to survive colder temperatures, even down to -30 degrees F. They are live bearers and can produce three to four broods each summer of about twenty-five to one hundred young each. You do not have to worry about them over-populating since they are also very aggressive towards each other. For wastewater ponds, add about 1000 fish per acre. The white clouds or the black and white stripy zebra danios are also great for a pond. They swim in a school, are attractive and easily munch up all the larvae. Do not feed the fish as you want them to be hungry for mosquitos. Tadpoles not only eat mosquito larvae, but they grow up to become toads or frogs, which will eat adult mosquitoes. One toad can consume about a hundred mosquitoes a night. Some insect eating bats can catch up to 600 bugs in only an hour! At night, bats come to life and flit through the air, using their sonar-like echo-location to hunt the tiny insects. Bat houses, like bird houses, offer bats a safe place to live. Setting one up in your yard will encourage these flying mammals to take up residence there and help control your mosquito population. Bat houses are wooden structures that look like plain boxes. There is a shallow opening on the bottom where the bats can enter. The small dark boxes imitate bat's natural dwellings, like small caves and hollow trees. There is however a slight rabies risk with bats. The best habitat for mosquito larvae is shallow stagnant water so you want to avoid this. Stagnant water conditions are slow moving or motionless still water with low oxygen levels and high nutrient levels. Any area of your pond that has shallow or still water will be a breeding ground for mosquitoes. This includes the surface of aquatic plants, water in the top of submerged pots, and shallow water near the edges of the pond. Trim any vegetation that hangs over the edge of the pond that might provide shelter for mosquito larvae. Having paving slabs rather than vegetation round the edge of the pond is a good idea. Making the surface of the water agitated using a fountain or waterfall or air bubbler will make it unattractive to female mosquitos so they don't lay eggs. Also Mosquito larvae are air breathers with a breathing tube like a snorkel that must break the surface of the water for them to take in air while they stay under water to look for food. If the water’s surface is moving, it becomes difficult for them to breathe and they drown. Newly hatched mosquitoes must rest on the surface for a few minutes to let their wings dry, because of this their mothers will not lay eggs in water that is constantly moving. You want high oxygen levels and you can achieve that with aerators, waterfalls, and streams. You want lots of water movement from pumping systems, skimmers, and bottom drains. Ideally you need to keep the water flowing at all times. If this is not possible then a few hours a day is better than nothing. 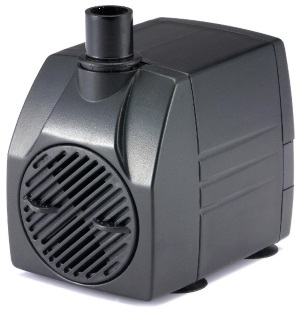 For a fountain you need the highest lift (say 6 feet), for the least power usage (say 25W), for the least money (say $27) so you can afford a few of them. You want low nutrient levels and you can achieve this with filtration systems, water treatments, and aquatic plantings. Bti (Bacillus thuringiensis) is a naturally occurring type of bacteria that will kill mosquito larvae and some fly larvae, but is not harmful to fish, pets, wildlife, or humans. It is commonly sold in doughnut shapes under the name "Mosquito Dunks" or "Mosquito Bits." One dunk treats a 100-foot area for 30 days. "Mosquito Dunks" are available from home supply stores such Home Depot or Lowes. Mosquito larvae eat algae and small organisms which live in the water. Bacillus thuringiensis israelensis is a bacterium that when eaten by the mosquito larvae induces a fatal dysentery-like disease that kills them. It is highly selective, killing only the larvae of mosquitoes and a few other related flies. It is best to use a combination of strategies. I opted for a fountain that is often on, a deep tank with paving slabs round the top, and a bunch of mosquito-fish.